WTI crude oil oscillates around $63.50, and gold is sliding lower, cracking below the $1,300 level. 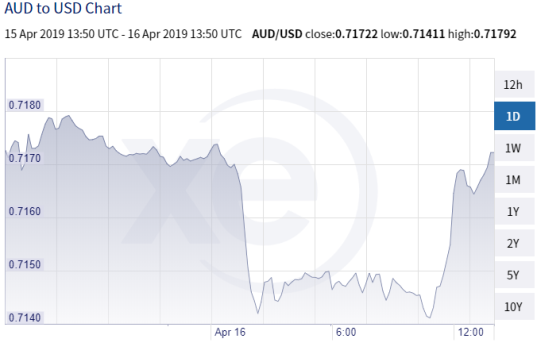 The Australian dollar made a quick reversal from its lowest level in a week after the Reserve Bank of Australia discussed scenarios of cutting rates. The minutes from the last monetary policy meeting showed the members were opened to reduce the cash rate from current levels (1.5%) if inflation and unemployment remained subdued. The greenback, tracked by the DXY Index, is trading relatively flat against its major peers. Currency market prefers to adopt a cautious approach and is struggling for clear direction. We expect volatility to go a notch higher with a slew of data out of China later today. Q1 GDP, industrial output and retail sales report cards will provide enough substantial clues on the direction of the global economy. Equity markets are trading higher, pricing in better than expected numbers after the recent fiscal stimulus package from Beijing. Gold is sliding lower (down 0.7%) while crude oil is steady, trading at $63.60 a barrel. Employment data out of the UK this morning matched market estimates. The unemployment rate was at 3.9%, its lowest level since 1975 and average weekly earnings, after adjusting for inflation, rose 1.6% compared to last year. GBP/USD is fluctuating around the mid-point of 1.3000. Investors are hoping that MPs are doing their laundry behind closed doors and agree on a Brexit Plan next week. The ZEW Indicator of Economic Sentiment for Germany moved into positive territory as the economy attempts to make a slow recovery. The survey, however still points to an uncertain outlook in the coming six months. EUR/USD remains within the recent consolidation range around the 1.1300 handle. The Canadian loonie came under heavy selling pressure following the release of a surprisingly dovish Business Outlook Survey. The spring report revealed a moderation in overall demand, weakness in housing markets and growing uncertainty in the Canadian energy sector. Trade tensions are also weighing on exporters’ sentiment. USD/CAD is expected to remain within recent ranges, with a bias to the upside. Australia's domestic economy is slowing “markedly” with weak consumption and soft housing market. AUD investors await on the release of Chinese economic data to decide on next directional move. USD/JPY remains inside a consolidation zone near a four-month high. The Nikkei gapped higher despite soft data. March Tertiary Industry Index fell by 0.6%, below market estimates. Investors wait on Chinese data for more trading action.